Vitamin D food supplement in a natural olive oil base, for infants and young children. Give to your child orally, as below. Give 0.5ml once daily as marked on the syringe (syringe included). Do not give more than the recommended amount. For ages birth to 4 years. A measuring syringe is included. 3. Carefully administer drops onto infant's tongue. Rinse and dry syringe after use. Do not use in steam steriliser. Replace bottle cap tightly after use. Food supplements must not replace a varied and balanced diet and a healthy lifestyle. As with other food supplements, consult your doctor or pharmacist before giving to your child if they are under medical supervision , have epilepsy or suffer from food allergies, or are allergic to any of the ingredients. Keep tightly closed and store below 25°C in a dry place, out of sight and reach of children. Once opened use within 3 months. 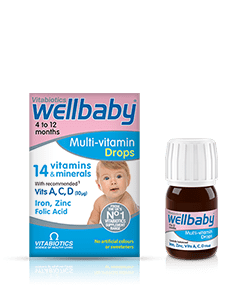 How much liquid does Wellbaby Vit D Drops contain? How and when should Wellbaby Vit D Drops be taken? Are there any undesired effects whilst taking Wellbaby Vit D Drops? Is Wellbaby Vit D Drops suitable for vegetarians? What are the active ingredients in Wellbaby Vit D Drops? 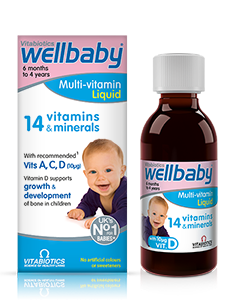 From the makers of Pregnacare, Wellbaby Vit D Drops has been developed especially for infants and young children to provide the exact level of vitamin D recommended by the UK Department of Health. Vitamin D is needed for normal growth and development of bone in children. It also contributes to their normal immune system function. The UK Department of Health recommends that babies from birth to one year of age take a daily supplement containing 10μg of vitamin D*. Wellbaby Vit D Drops provides 10μg of vitamin D per daily dose. *Unless they are drinking 500ml or more of infant formula a day, as infant formula has vitamins added to it. 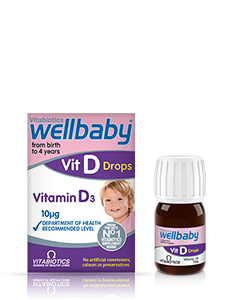 Wellbaby Vit D Drops contains 30ml per bottle, enough for 60 days at the recommended of 0.5ml/ taken once daily. Suitable for infants from birth to 4 years. Give 0.5 ml (marked on the syringe provided) once a day. Wellbaby Vit D Drops has no known side-effects when taken as directed. Do not exceed the recommended daily intake. In case of overdose, seek medical advice immediately. As with all supplementation, seek professional advice before using if your child is under medical supervision or suffers from any food allergies. Yes. Wellbaby Vit D Drops is suitable for vegetarians. Wellbaby Vit D Drops contains the following active ingredient per 0.5ml: Vitamin D (as D3 400 IU) 100μg. Vitabiotics avoids 'mega dose’ levels of isolated nutrients and instead we have always stressed the importance of safe, moderate and sensible levels of vitamins and minerals, carefully balanced to maximise their combined effect, an approach which has been supported by many experts and researchers over the years.